Nothing can be compared to the feeling I had the first time I went into Sao Domingos Church. I felt like I was out-of-place, out-of-time, but at the same time I felt in the right place and timeless. This church is different from the others due to the fact that it suffered a huge fire in 1954, where all the interior ornaments and tapestry were completely burned down. What was left was only the naked colourful marble on the walls and the unrecognizable marble statues. In a very strange resolution, the church was never reconstructed entirely, so it shows all its opened bruises with such an honesty that surprises us completely. They only painted the ceiling in a pastel color, kind of orange, which reminds even more of a Greek or Italian classical temple. 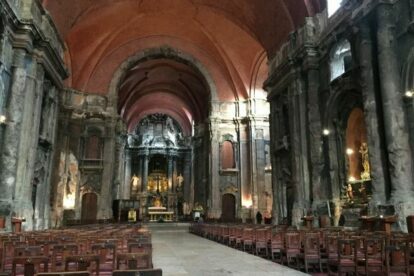 The church is as old as Lisboa’s Cathedral, its contruction started in 1241. Unfortunately most parts were destroyed in the 1755 earthquake, and it was rebuilt after with some leftovers from other destroyed buildings. A very important one is the entrance portal and balcony, that came from the old Royal Palace, “The Ribeira Palace”. This church is special and it’s worth a visit even if you are a non-religious person, or of a different religion. Whatever your beliefs are, I doubt you will be indifferent when entering this church, One never is.